When Koch Kuts designs and builds your outdoor living space, relaxing in your backyard will quickly become your favorite past time. Down to every detail – from the hardscape aspects you want to plant and lighting fixtures – we help you understand your choices, make the right decisions based on your landscape and budget, and meticulously plan for the best installation possible. Make your backyard dreams a reality, give our Burlington landscape designers a call to discuss your designs and get a free estimate! Patios are the foundation of any outdoor space, and you have a lot of options to choose from – shape, size, brick, stone, concrete. Does it need a bench for easy sitting or maybe a built-in grilling area? Koch Kuts will make sure you’re getting exactly what you want by designing and installing a custom patio to suit your unique style and yard needs. 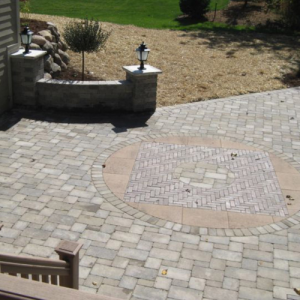 Better yet, our experience and quality hardscape materials assure a patio that lasts. 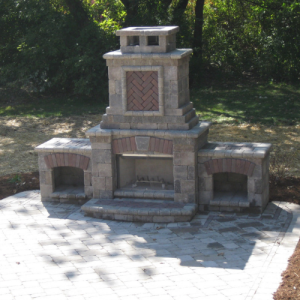 Installing a patio with a fire pit is the perfect solution for homeowners on a smaller budget. You’ll gain a beautiful and convenient space for entertaining friends and family at a lower investment. If you’re looking to make a bigger statement or add a cozier feel to your outdoor space, a brick fireplace may be a better option for you. For many Wisconsin landscapes, the perfect outdoor living space consists of more than just a patio. Retaining walls are often necessary to control landscape erosion and create level ground near slopes. They’re also popular as an aesthetically appealing option for closing patios off from their surroundings or enhancing gardens. Finish off your outdoor area with a stone or brick walkway and steps; pulling your home and landscape together while improving property value. 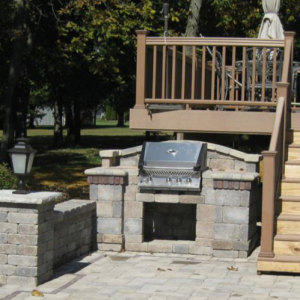 Whether you’ve just moved in and are transforming your drab backyard, or finally saved enough to make your outdoor living space dreams come true, Koch Kuts is the best choice for hardscape services in SE Wisconsin. Contact Koch Kuts for a quote on outdoor living space design and installation.